Are you experiencing hatom structured data errors in your Google Webmaster tools? I am sure most of you must be and wondering if these errors could be bad for you. These errors may not haunt your blog performance but for a healthy site one would certainly not like these errors to stay in the Google webmaster tools. 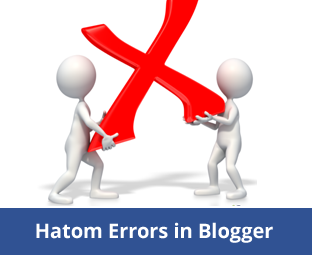 Today in this article, we will show you how to fix hatom structured data errors in blogger. What are Structured Data and its hatom errors? Structured Data information is the structure of your blog and blog post that how they are structured in the search engines. It is the feature of Google Webmaster Tools which mainly deals with the structure of your blog and blog post. And, the hatom error occurs when webmaster tools finds any kind of errors in structuring your blog posts and pages. Keeping the errors unfixed can affect your site optimization at some extent. Therefore, you must go for the fixes. Before, moving towards the fixes let us list all the common errors which may encounter in your structured data. We have added the fixes for each error. After discussing much about structured data errors, we are taking you right towards the guide which we have created for your convenience. 3. In last, Save your blogger Template. 3. After replacing, Save your blogger Template. 2. Ones you found it simply replace the complete code with the below one. 3. After that, Save your blogger template. How to Check Errors are Fixed or Not? If you are not certain that your errors are fixed or not then simply you need to follow these steps and you will come to know about structured data status instantly. First of all, go to Structured Data Testing Tool. Now enter the URL of your blog in fetch URL. If it gives the status like below image that means your errors are fixed, if not then that means you’ve made somewhere a mistake. Your blog is free from errors now! Now we are sure that all these errors are fixed. If you are facing any problem while applying these steps, then drop your query in the comment box. Any of our team members will get back to your query as soon as possible. Was it helpful? If it was then don’t forget to share this article with other bloggers too. You may never know that your share may be proven helpful for many of the users out there. Thanks for your article really helpful i have fixed 2 errors but still showing blog posting 36 errors how to remove that showing this msg ..
Error I receiving these errors when I run the google structured data test. Im using the Iconic One theme.